Hello friends! I am really enjoying all the tropical images that companies are coming out with this summer. 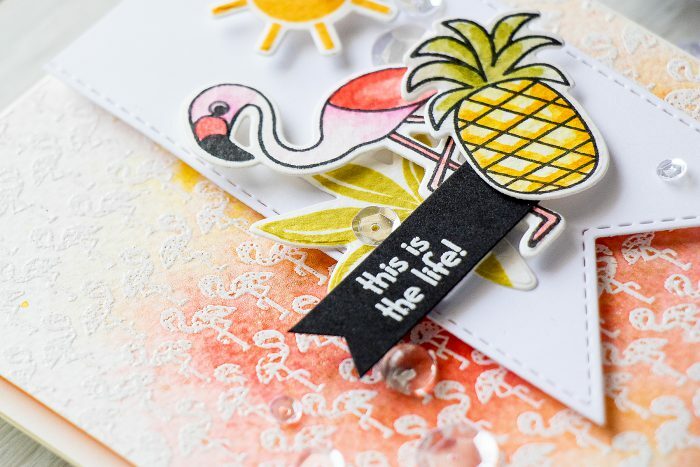 Flamingos, pineapples, tropical leaves – you name it! 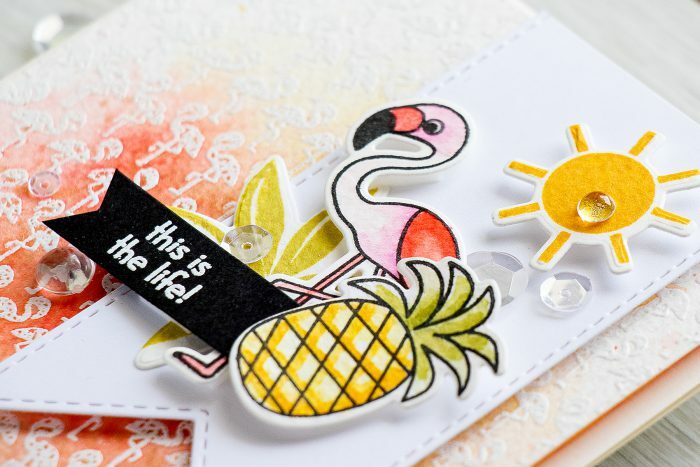 Today I’d like to share a card using Simon’s Summertime Animals stamp set. 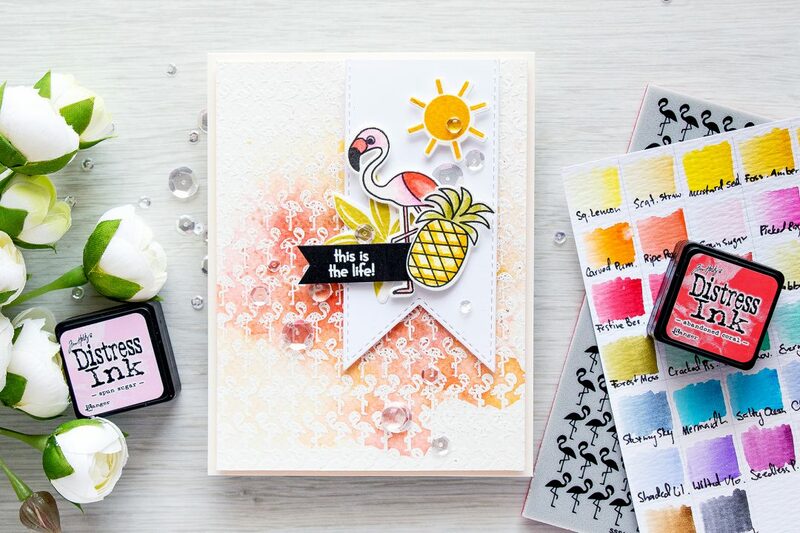 You might have already seen my Tropical Bear card & video tutorial using this set, there are so many fun images included – I’ll be sharing many more cards using it in the coming weeks. 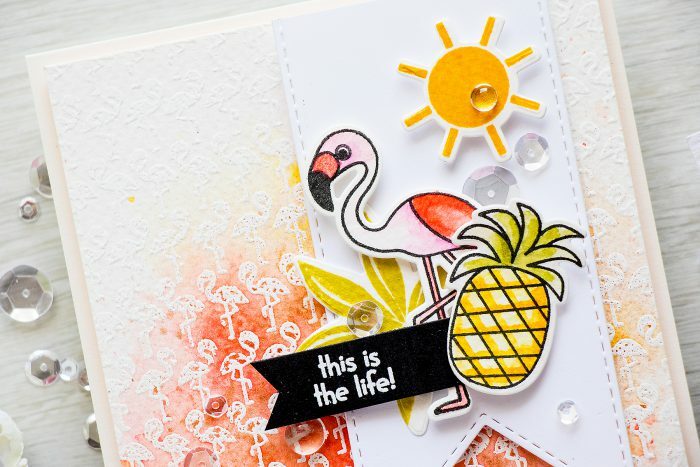 I started working on this card by heat embossing a Flamingo background in white embossing powder on watercolor paper. I smooshed a few colors of Distress ink to add color and spritzed my background with Distress Mica spray. I really love this product, it doesn’t reactivate distress ink, it only adds beautiful shine and shimmer to the background. 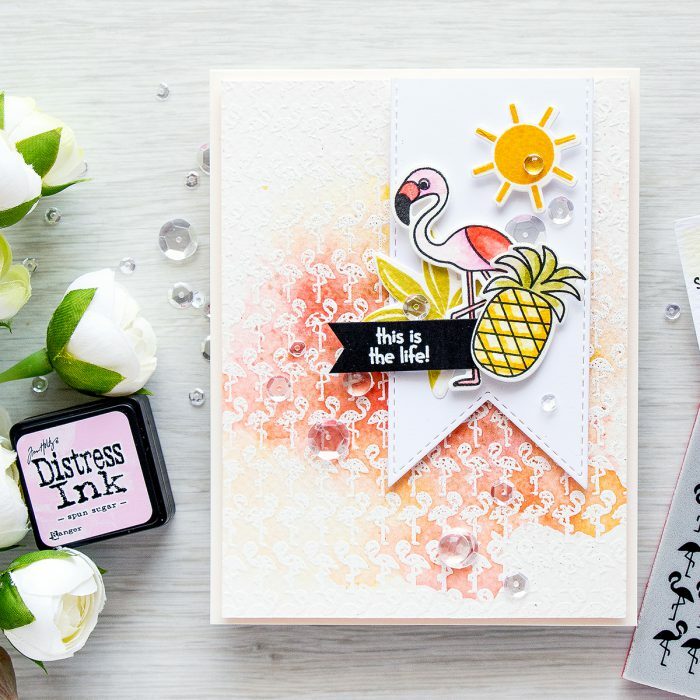 I also stamped flamingo and pineapple in VersaFine Onyx Back ink onto watercolor paper and watercolored these images using Distress inks. The sun was stamped in Sunshine and finally large tropical leaf in Catkin. I die cut all of these images using matching dies, also die cut a Stitched Banner and foam mounted my images onto the banner. I went with a simple This Is The Life sentiment and heat embossed it in white onto a piece of black cardstock. I foam mounted my banner onto the embossed background and foam mounted that onto an A2 top folding card base. I did add a few clear sequins and drops from Pretty Pink Posh to finish this card and add additional sparkle. Flamingos! Just love love love LOVE it! I did noticed you like tropical theme. One of the themes I will probably never be comfortable to work with. But it doesn’t mean that I cannot enjoy a great tropical card! It’s stunning! Such a great background! Hi Yana, great card! I love the background, they’re yummy colors. Makes me want to be on an island vacation sipping drinks on the beach, lol! Thanks for sharing and inspiring. This is an extremely pretty card Yana. Very nice job!